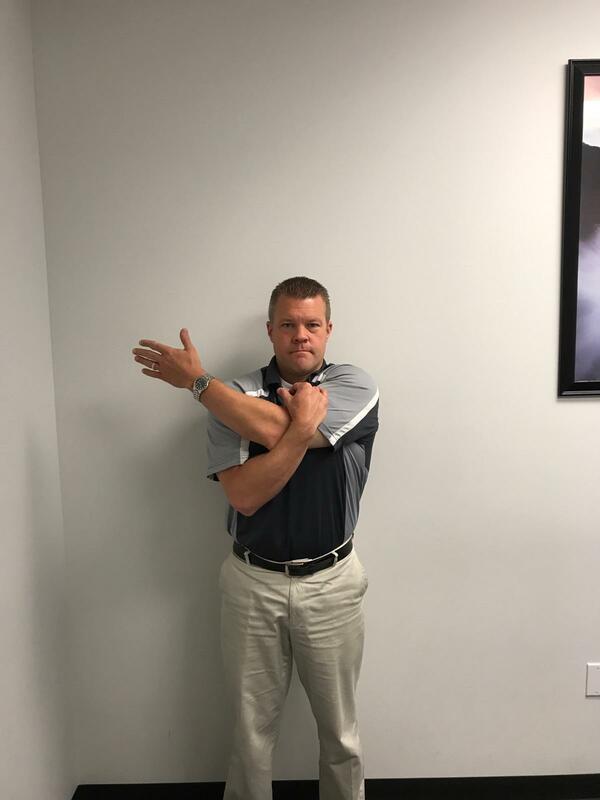 When Can You Golf After Rotator Cuff Repair? We have a results-oriented population here at SSOR and our clientele expect to be as functional or better than they were prior to surgery. Our patients are active and want to live an active lifestyle when formal rehab is complete. 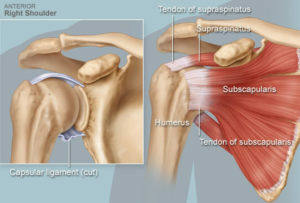 Rotator cuff repairs are a common procedure we see around here and we have many people that want to play golf again when it’s all said and done. Inevitably we get asked, “When can I play golf again?” Unfortunately, there are no controlled studies that look at this question. The decision is largely based on what the orthopedic surgeon feels is appropriate and hopefully, after consultation with the physical therapist. 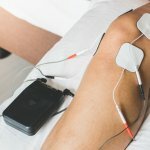 Hopefully, this post will help answer some questions. What’s the big deal? The tear is “repaired” right? It’s a little more complicated than that. First of all, your physician needs to give you the “green light” to play. Your age matters too. Typically, the older you are, the more the tissue is less elastic and well, there’s some “tread on the tires” so to speak. The size of your tear and the quality of the tissue also matter. If you have a small tear and good tissue, you’ll likely be able to play sooner. However, if you have a massive tear, are older, and the tissue that was repaired isn’t good quality, you’ll probably wait much longer to play. Truthfully, something to consider too is how good a golfer you are. If you don’t play much and don’t have a very good swing, you may for example, strike the ground in your downswing which could hurt your surgically repaired rotator cuff. Experienced golfers typically have a better, more efficient swing which will help minimize the risk of re-injury. Lastly, your medical history matters too. If this is a revision rotator cuff repair, you’re likely to have a much more conservative post-operative course and a longer time before you can golf again. What should I be able to do before I can play golf? 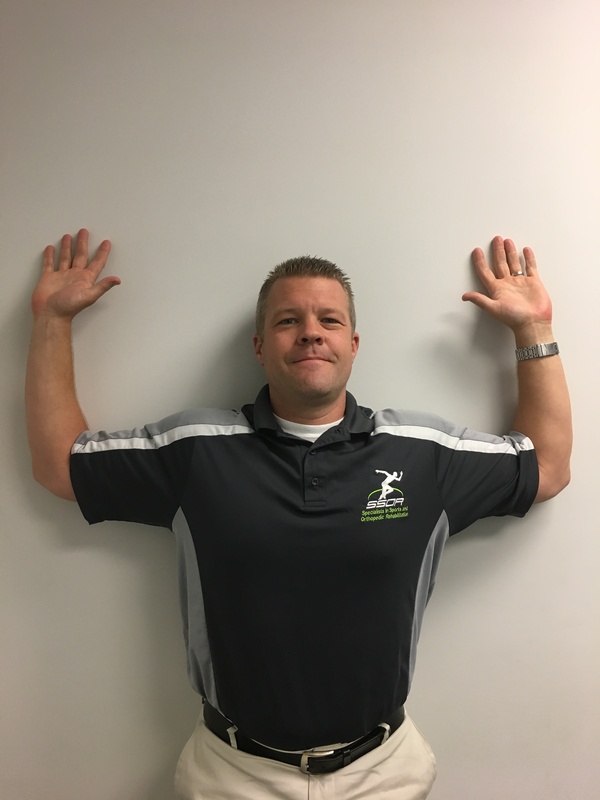 Range of motion is critical after your rotator cuff repair. The pictures below show a few examples of some things you should be able to do. 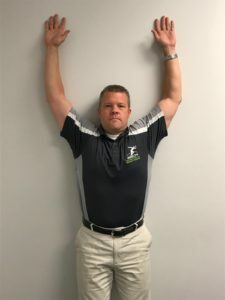 First of all, you should be able to flatten your back against the wall and raise both arms overhead in Figure 1 (like you’re saying “Touchdown!”). If that doesn’t feel symmetrical or very close to it, you don’t have enough flexion range of motion. Another is a “wall angel” (Figure 2). Here, you put your arms at 90° and try and raise your arms, keeping them on the wall. Painful? Can’t get there? Well, there’s some mobility restrictions there that you’ll need to keep addressing. 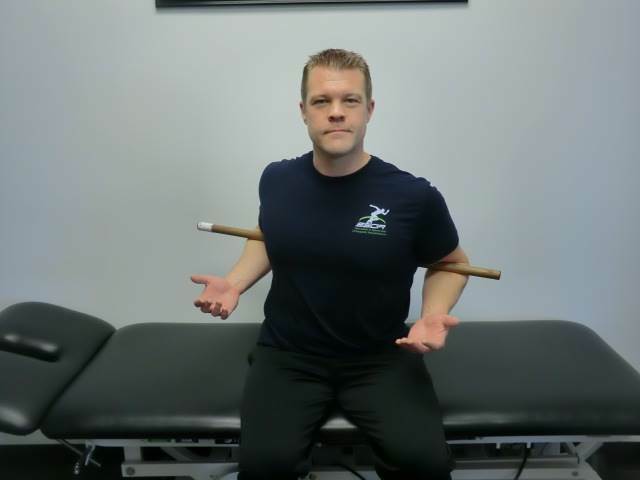 Lastly, because your arms have to go across your body, you should be able to do that without “hiking” your shoulder to get there or without pain (Figure 3). Lastly, you have good strength of your rotator cuff, and the only way to really know that is testing from your physical therapist. What should I work on to maximize results for my golf game? Obviously, range of motion and strength in the shoulder are critical. The “genie stretch” pictured below can help increase posterior shoulder mobility so you can bring your arm across your body. Another very important component is thoracic rotation, pictured below. Thoracic rotation is important for two reasons. First of all, the more your spine can rotate, the less strain on your shoulder. Without thoracic rotation, your shoulder will have to compensate or “overcorrect” for the lack of spine rotation, which could damage your recently repaired rotator cuff. Secondly, your swing is more efficient with better rotation. Think of winding up a toy – the more it’s wound up, the farther it goes/faster it moves. Well, the more you can rotate, the more you can “coil” and “uncoil,” effectively using your body’s own elastic energy. Of course, mobility in your hips matters too. As we age, we lose mobility there too. Without hip and thoracic spine mobility, you’ll be needing us for physical therapy for low back pain. Seated thoracic rotation. Place a ball between your knees and make sure your feet are flat on the floor. Rotate each direction. So when can I play again? We have to define what “play golf” means. Full, unrestricted release to playing golf is much longer time frame than say, putting and working on chipping. Again, provided your doctor gives you the OK, you can start putting around weeks 6-8 or so once you’re out of the sling. Chipping and working around the greens is the next step and usually you can start that somewhere between 12-16 weeks post-op. From there, a progressive return to golf program starts with working on irons and of course, hitting off the tee is last. Most people are back on the course playing with no restrictions anywhere from 4-6 months after surgery. Again, all of that depends on factors mentioned above – age, size of tear, quality of tissue, experience playing golf, other medical history that may affect your swing. 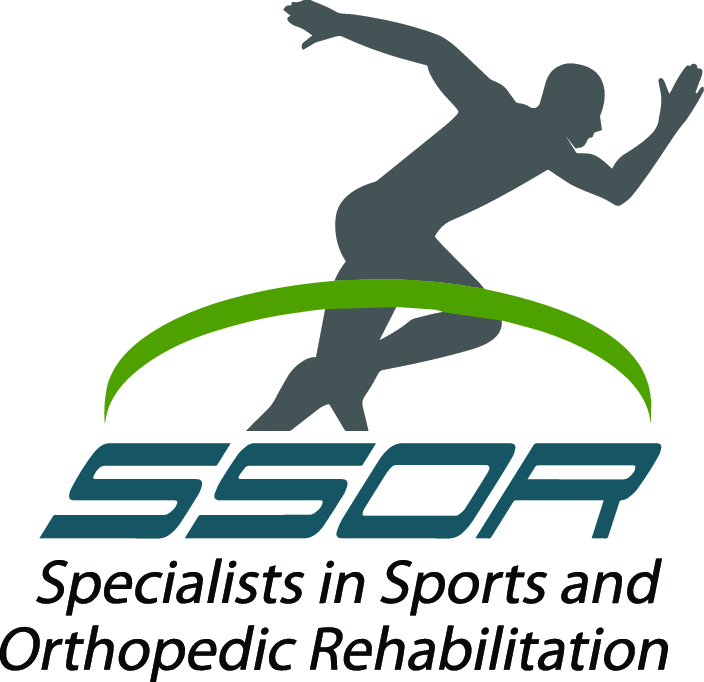 If you had rotator cuff repair, look no further than the expert staff at SSOR to help you restore your function and your way of life. Athlete or not, we understand what is done surgically and what has to be done long-term for you to maximize your outcome. If you love to play golf, this is the place to be – we know what it takes to not only get your shoulder right, but make sure you’re at your best when you get back on the links again. It would be a privilege to serve you and partner with you in your care. Give us a call!